The purpose of power factor correction is to condition the line current. To condition simply means making the line current smooth by filtering the spikes and any irregularities in the waveform. A smoother line current will have low power loss. Some images below are showing a line current with a very bad power factor. 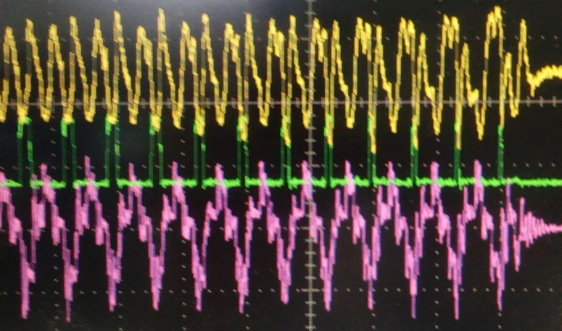 The yellow and pink waveforms are actual line currents measured from a three phase grid wherein the system load is a power supply without a power factor correction. Supposedly the waveform is close to a pure sine wave if the power factor is excellent. Below waveform is another scope measurement with different loading conditions. Still the waveform shows a very bad power factor. Power factor correction is a circuit that will modify the circuit power factor. It can be a passive or active. 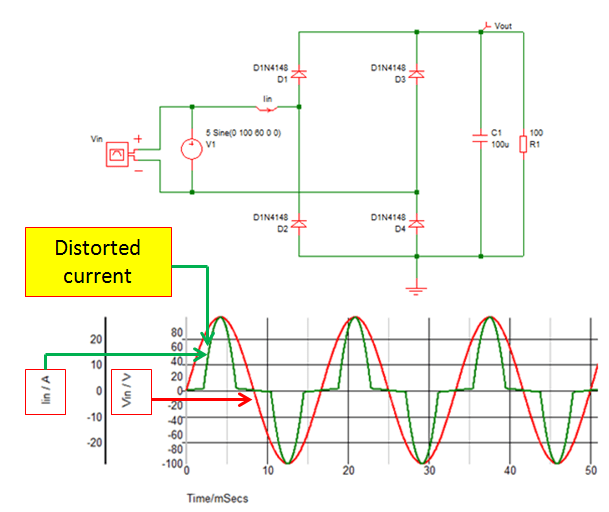 The purpose of a passive power factor correction is to make the voltage and current to simply align or having the same phase or when you plot in a waveform, the current and the voltage will overlap. Passive power factor correction is good only for loads that has no rectification involves like inductive or capacitive. Passive power factor correction only uses passive devices. Below is a simple inductive circuit. Based from simulation, the current lags voltage. With the inclusion of a passive power factor correction, the current and voltage must become in-phase to each other. After adding a simple power factor correction circuit which is a capacitor, the new waveform is below. You can see a great difference here. The voltage and current are in-phase already. An active power factor correction is needed in advanced circuits like switching mode power supply and converter. It uses active devices and circuits to do the job. Below is a circuit with a rectifier. A rectifier is a non-linear circuit. You can notice on the waveform that the current (green waveform) has a bad shape. It supposed to be a sinusoidal shape like the voltage (red waveform). An active power factor correction is needed to correct the current shape. Why need to Improve Power Factor in General? A poor power factor will results to high RMS and peak currents drawn from the power source. This means a higher transmission loss in the part of electric companies. A higher current may require a larger transmission lines that are expensive and they may repair equipment too often. The electric companies charge the losses to their consumers. A poor power factor will result to high current harmonics and this potentially cause flicker issues. If the product is to be used in LED lighting or any lighting, the flicker effect will be very obvious. A lower power factor product will lose its competitiveness in the market. It may not new to you that there are many power savers advertised nowadays. These are small handy electronic products that when you plugged in into a power outlet, the current reading will become lower. Actually, it is not a real power saver that all of us are exactly thinking about. Although the current is going low once the device is attached, it does not mean that the real power we consumed as a consumer will decrease. The real power we consumed is always the product of the voltage, current and the power factor. With a poor power factor (lower than 1), the current will be higher. On the other hand, with a good power factor (almost 1), the current will be lower. When we multiply the current and power factor in both scenarios, it will result to the same value and the same real power we consumed. However, by lowering the current peaks and then its RMS value, the power losses due to the longer wires will be minimized. Thus, this power saver is may be helpful a bit in huge establishments and factories. The purpose of power factor correction is simply to make the line current smooth. A smooth line current is good for several reasons. This is what I am looking for since I am planning to have a power saver. I have learned a lot, Thanks for sharing. This is very helpful to prevent power loss, thanks for this i learned a lot from this!